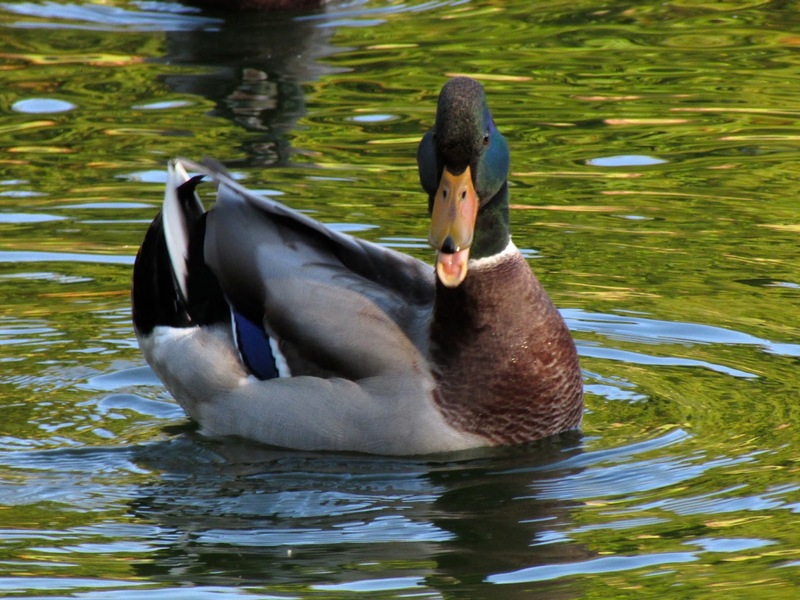 The drake mallards at the park have now almost completely finished their summer moult and are sporting their dazzling fresh plumage. 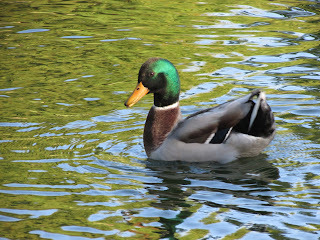 Mallards start the breeding season quite early. The first stage is pair formation, which starts in September-October. Any unpaired females attract the attention of drakes and a flock of suitors surrounds her, parading. A trademark display of many ducks is the 'grunt-whistle'. In mallards this consists of a sequence of behaviours including a whistle, at the same time that the duck lifts both his head and tail. The fact that there are usually many males displaying at once and any of them can carry out the behaviour, means that I've had trouble recording in it a photo previously. By the time I head a whistle, or several, I have missed the behaviour. 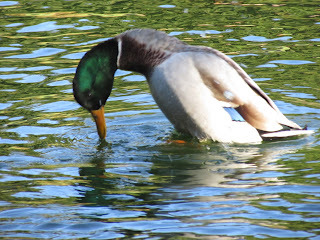 This week in the park, when I noticed the mallards courting, I decided to focus on a particular male and try and catch him doing it. The first step of the grunt-whistle sequence looks like the duck is about to dive. Instead, he arches his head forward forcefully, and his bill tip scoops an arc of water droplets toward the female. I managed to get two shots of this stage. The second shows the droplets quite well. Then is the whistle, while lifting the tail and head (note the bill is a little open). 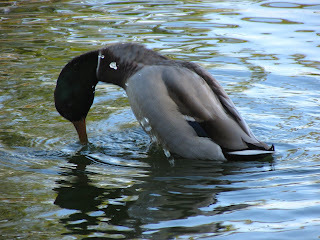 After that, the drake turns to the female (top shot), and then swims fast with head forward, almost touching the water. I will try and get a video of the whole sequence in the next few weeks and upload it here. 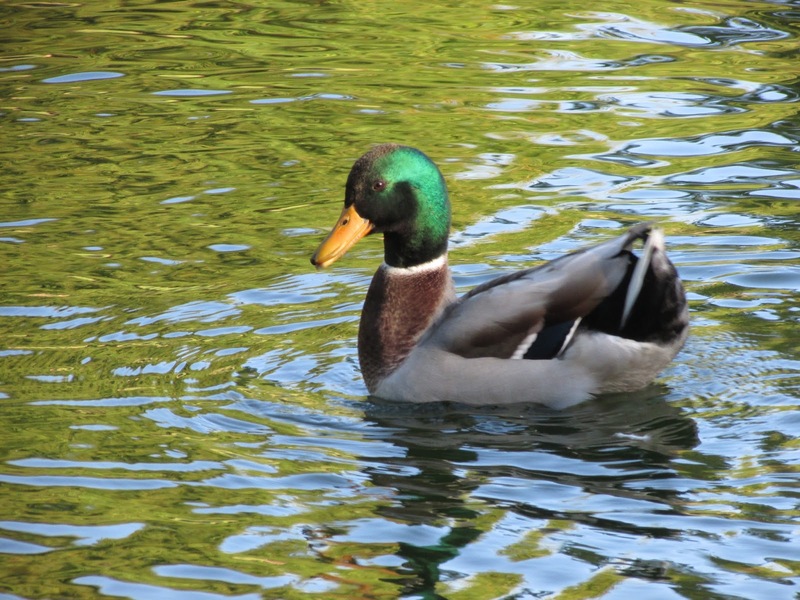 Wolfgang M. Schleidt & Erhard Oeser (2011) Konrad Lorenz’s use of cinematic film for studying dabbling duck courtship behaviour and the availability of historic film materials. Wildfowl 61: 45–51. Here.